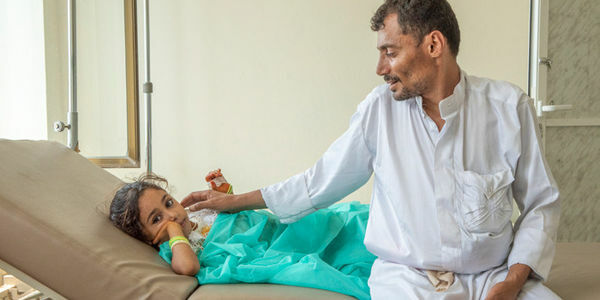 Yemen is being devastated by war and civilians, like Abdullah and his daughter Nehan–currently being treated for cholera in a Mercy Corps supported clinic, are caught in the middle. Innocent people are struggling against three unimaginable nightmares: hunger, disease and economic collapse. According to the United Nations, more than 22.2 million people, 75% of the population, are in need of urgent humanitarian support. This is a man-made crisis that no amount of humanitarian assistance will overcome. Atrocities are being committed on all sides. A political solution is the only way to end the conflict. The UK Government is in a strong position to help put an end to the suffering and should use all means possible to press parties to end violence and engage in the peace process. It is essential the UK Government reaffirms its commitment to ending this brutal and needless conflict. Sign now to tell Foreign Secretary, Jeremy Hunt, to prioritise the people of Yemen and maintain pressure on the warring parties to meaningfully engage in the United Nations-led peace process. I can no longer stand by and watch families in Yemen struggle with hunger, severe outbreaks of cholera and economic collapse. War and an economy in freefall have conspired to take Yemenis from poverty to starvation. As an influential leader on the world stage, and the fourth largest donor of humanitarian aid to Yemen, the UK Government must do more to stop the suffering and bring about lasting peace in Yemen. I call on you to use your position to bring the warring parties to the peace table and end the conflict. The path to solving hunger starts with peace.